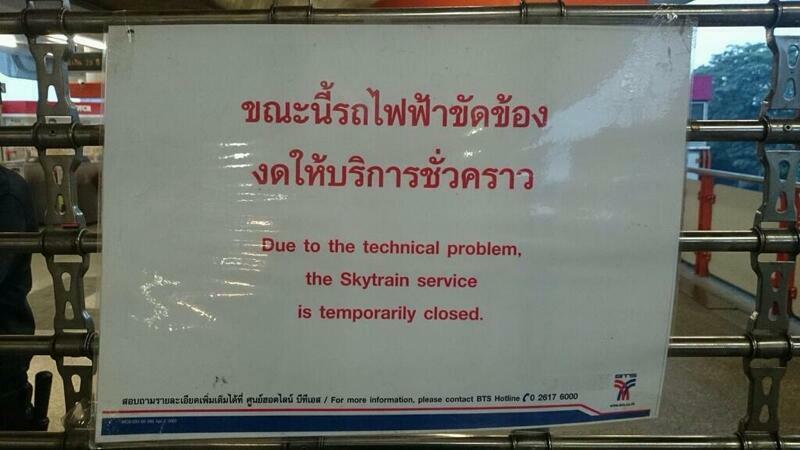 The BTS skytrain service was disrupted by technical error Tuesday morning. Passengers could not use the service at all stations. The disruption of the service started at 6 am according to a Tweeter message from BTS. By 8 am, the service has not resumed yet. BTS announced on its micro-blogging Tweeter site that the service was halted because BTS navigation control system malfunctioned. The BTS announced that at 8:03 Tuesday that it does not know when the service will resume following the malfunction of its navigation system. It said radio communication system of the trains broke down and it was the first of such technical error in 14 years. The system error happened at 3 am. BTS urged the passengers to turn to use other public transport means. Skytrain service at Asoke station is still not resumed despite BTS’s announcement that all services were in place after the break-down early morning. BTS is fixing the problem as there were some passengers trapped in a car when the function at Asoke station went down. The testing of a new platform screen door caused an eight-hour failure of the BTS skytrain system that caused commuter chaos in Bangkok on Tuesday morning. A screen inside BTS carriage shows notice that the train cannot moved due to system malfunction on Tuesday afternoon. The test triggered a malfunction of the signals communication system, which controls the trains, leading to a total shutdown. Anat Arbhabhirama, adviser to the board of director of Bangkok Mass Transit System which operates the BTS skytrain, told a press conference Tuesday afternoon that the testing of platform screen doors at stations early Tuesday early morning had caused the signal problem. The company is spending around 600 million baht installing platform doors to improve safety for passengers. Similar doors already operate on the MRT train system. Mr Anat said tests on Silom line were completed. The company began testing the screen door system on the Sukhumvit line when the problem arose about 3am. The problem caused the cancellation of all services from 6am, when trains normally begin running. Bombardier Transportation Singals (Thailand) Co, which handles the service, was called into the fix the problem and full services resumed five hours late at 11am, he said. However, there was another signals interruption between Chidlom and On Nut station about 1pm, causing the service between these two stations to be halted for about half an hour. Mr Anat said Bombardier will check the signal system again after its daily service ends at midnight. All problems were expected to be ironed out before normal operations start at 6am Wednesday. He said the company had lost about eight million baht in revenue because of the failure. BTS informed commuters of the suspension of services via Facebook and Twitter, but many peak-hour passengers arrived at stations to find them shuttered and signs saying to find other means of travel, with staff giving similar advice. The company said it was the first time in 14 years of operation that the system had failed. The company would bring in software developers to help improve the system. The underground MRT was reported to be packed during the morning rush hours as commuters desperately sought other means of getting to work. 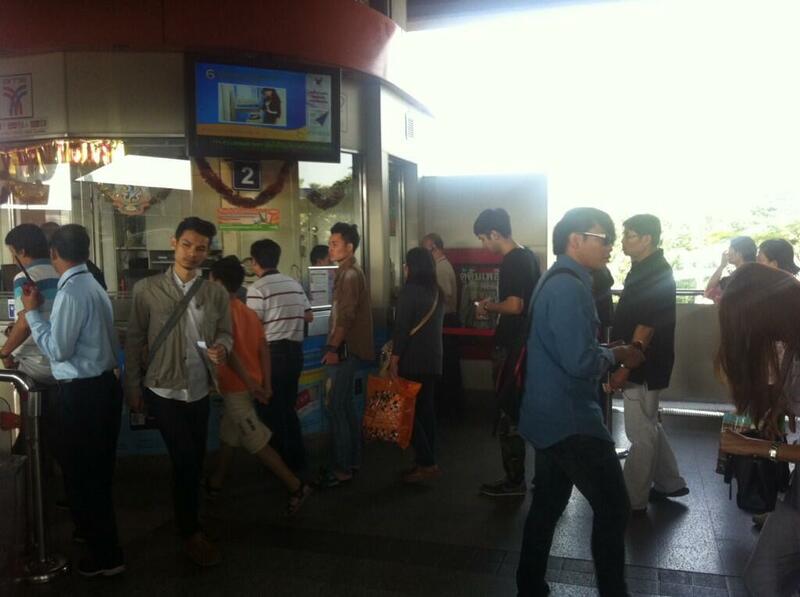 The MRT increased the frequency of services and sent empty trains to pick up passengers at Sutthisarn station. Traffic returned to normal as the rush hours ended. Roads were also reported to be severely congested with many people having to spend an extra hour in their vehicles on the road to work. Some commuters complained they were ripped off by motorcycle taxis, which seem to be the only available means of transportation as vacant taxis were extremely difficult to find. A 23-year-old commuter complained of a motorcyle taxi demanding 200 baht to take him from On Nut station to Asok, saying the "normal" fare was never more than 100 baht. He finally found a taxi which took him to his ultimate destination in Klong Toey for 150 baht. The Sky train system was fuked up well into the afternoon, still running but big delays. I walked everywhere today, no probs.